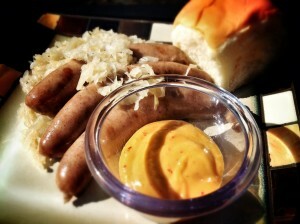 Hot Dogs & Sauerkraut, Here’s How – Recipe! Sauerkraut gets a bad rap! Comdiments for hot dogs go deep and wide, but generally sauerkraut gets overlooked. Is it preparation, is it the word “sauer” gets misconstrued? We recently did an episode on the hot dog, celebrating opening day of baseball season. 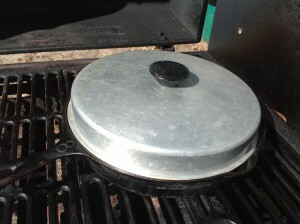 Here is a GrateTV process and recipe for an Icon that is often overlooked. Make your own Sauerkraut – Recipe! Watch the Hot Dog dog show! Good quality Hot Dogs. We used Keegan-Filion Longaniza. A farm made classic. There are many varieties of hot dogs available. Hot dogs fall into the category of sausage, so any sausage link could be considered a hot dog. 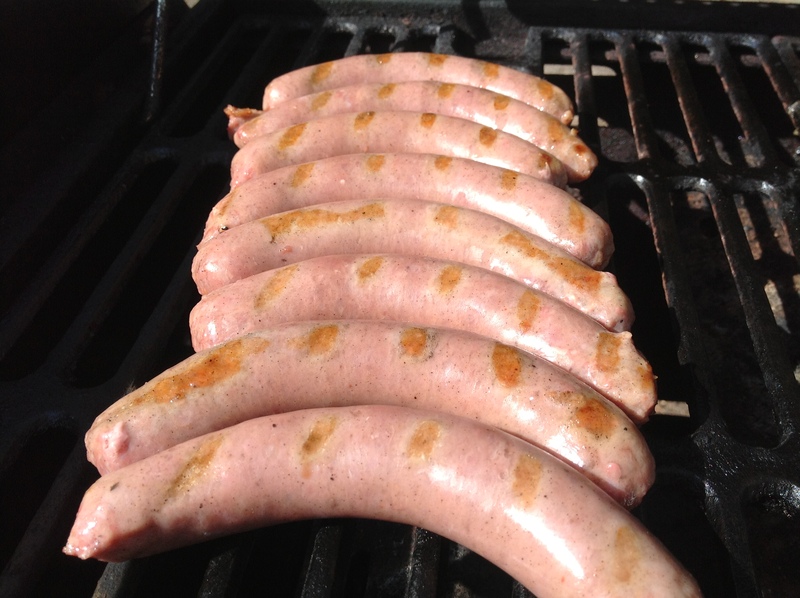 For this recipe Kielbasa would be a Grate choice. 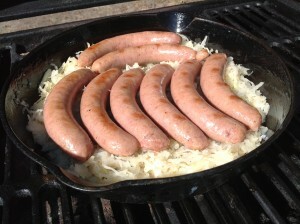 Kielbasa and Sauerkraut is a family tradition in many families. 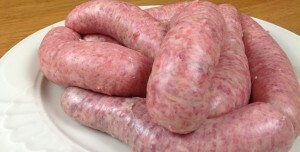 Make your own sausage and create a flavor that is unique! The bun is optional in this recipe. Hot dogs and Kraut are a good combination and garnished with a little spicy mustard, they make a meal. However, a sausage on a plate with a good kraut and mashed potatoes on the side is a tasty treat! Choose and prepare the Sauerkraut. Sauerkraut comes in a few different packages. There are bags generally available in the lunchmeat section of the grocery store, cans and jars are located in the canned vegetable section. Bags are delicious, and are good for making a large quantity. Jars seem to be better than cans, although the difference is minimal. Buy the quantity that is good for your own purpose. Open and empty the jar into a strainer. 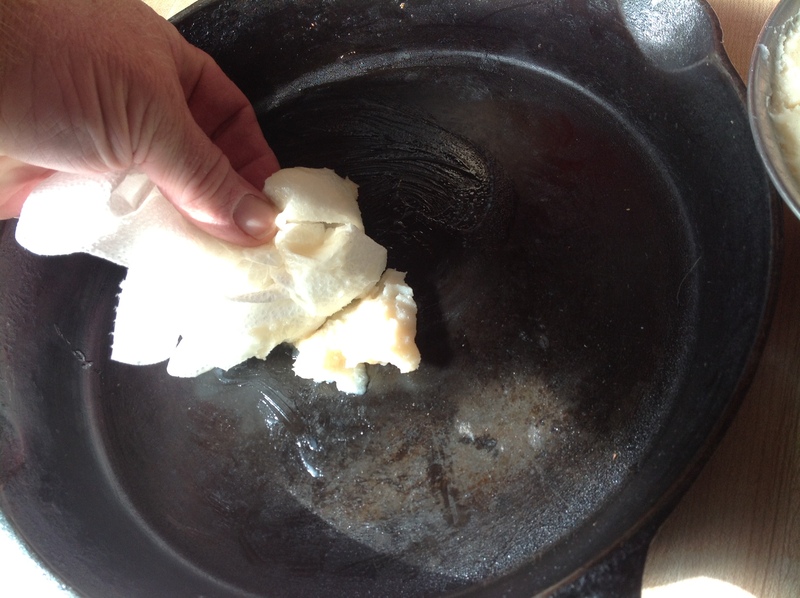 Rinse the cabbage well to eliminate any really sour notes. Put the washed kraut into a bowl. 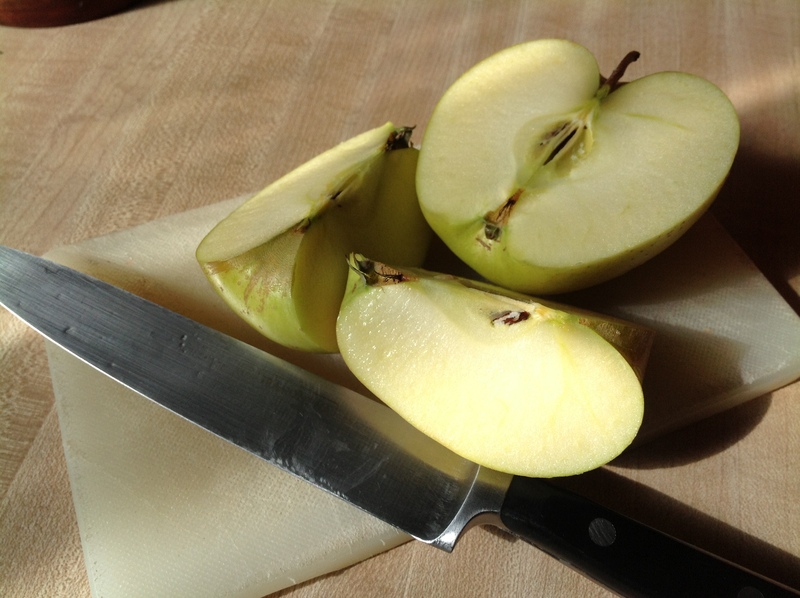 Cut and peel an apple into quarters. 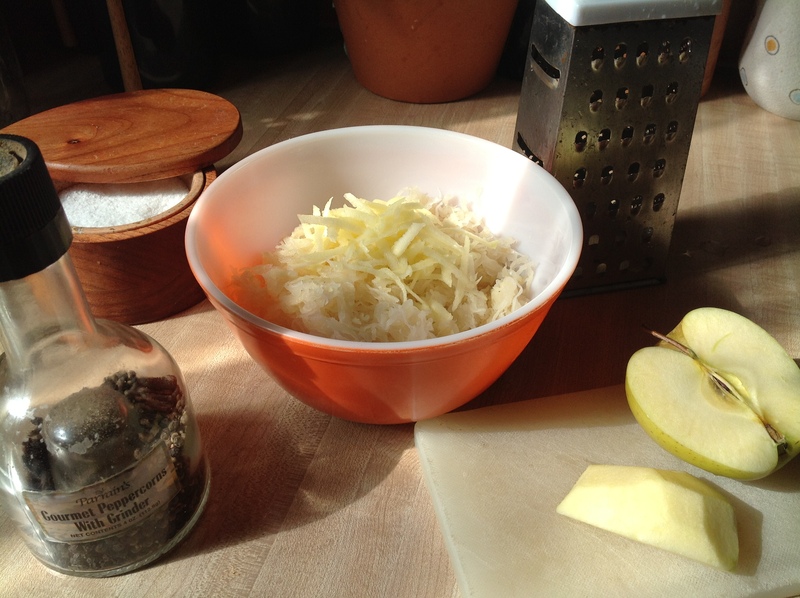 Grate the apple into the bowl of washed kraut and mix well. The apple will cook well with the kraut and give it a bit of a sweet tone. Add Freshly ground black pepper and a little salt and mix well again. 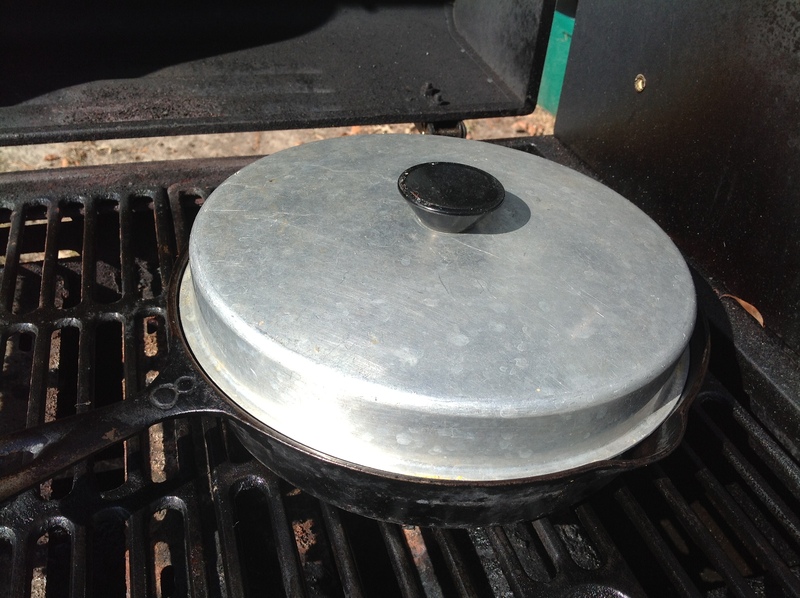 Prepare a cast iron pan. 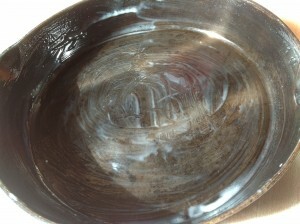 Grease the pan well with rendered bacon fat. The fat will give the kraut a delicious flavor. Add the Sauerkraut mixture to the prepared pan and set aside. Put the hot dogs or sausage on a medium high heat grill for a few minutes on each side to get some grill marks. Serve with spicy mustard and a soft roll. Delicious!! 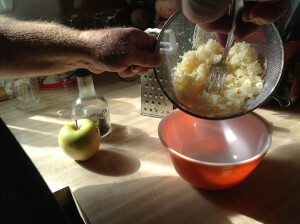 Make your own Sauerkraut – Recipe Courtesy of Alton Brown and The Food Network! Approximately 330 million pounds of cabbage are grown each year in the United States. The states that produce the most cabbages for sauerkraut are Wisconsin, Ohio and New York. Sauerkraut is available in cans, jars and polybags. The polybags are found in the refrigerated section of the supermarket and need to stay refrigerated. Sauerkraut continues to be the country’s second favorite hot dog topping after mustard, and millions of pounds are used in Reuben and other deli sandwiches each year. As it becomes better known as a flavorful, low-calorie, no-fat food, it is being included in more innovative dishes around the country. 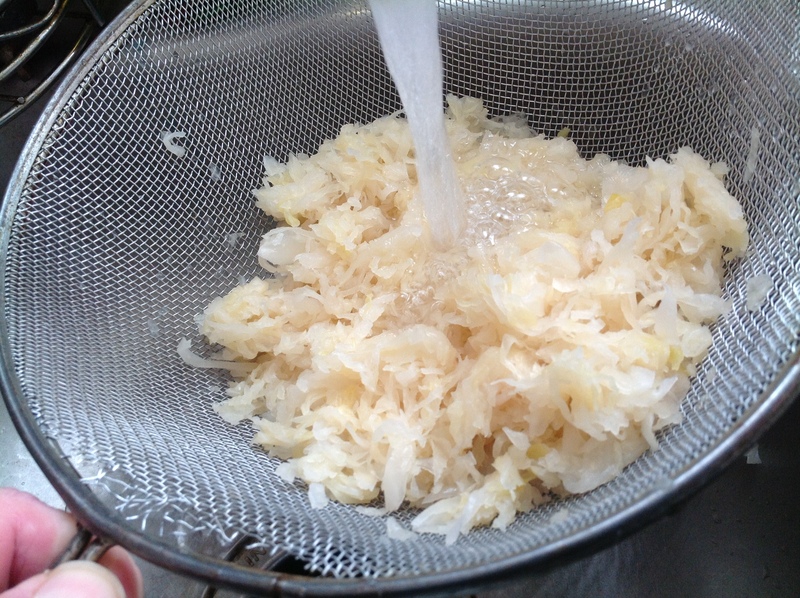 Sauerkraut is made from the crisp center leaves of the finest quality cabbages which are shredded, salted and cured for several weeks in huge wooden or concrete vats. Sauerkraut is the western counterpart of kimchi, except that it doesn’t contain as much seasonings and ingredients the way kimchi does. 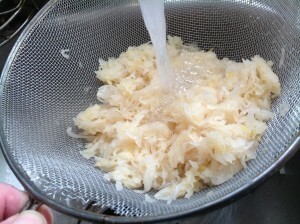 Popular in the Europe and America, sauerkraut usually only has shredded cabbage and salt as the main ingredients. It’s produced by allowing salted cabbage to ferment on its own without the addition of any starter or vinegar for two weeks or more. Americans annually consume 387 million pounds of sauerkraut, or about 1.5 pounds per person per year. It also is low in calories, with one cup of undrained sauerkraut having only 44 calories, and one cup of sauerkraut juice has only 22. Two Jenny-O turkey hotdogs mixed in bring it to 215 calories. 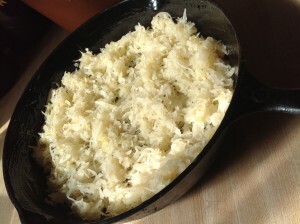 Sauerkraut provides almost one-third of the US RDA for vitamin C, plus other important nutrients including iron, calcium, potassium, phosphorus, thiamin, riboflavin and niacin. One cup also provides approximately 8 grams of fiber. Like kimchi, sauerkraut is high in digestive enzymes. It’s also a good source of natural lactic acid bacteria such as lactobacillus and pediococcus. Juice from sauerkraut is reportedly good against gastrointestinal conditions like diarrhea and constipation, and is recommended as an effective flu preventive beverage. Medical and health experts recommend eating several servings of cruciferous vegetables each week to reduce the risk of cancer of the colon. * Sauerkraut, like cabbage, Brussels sprouts, cauliflower, broccoli and turnips, is a cruciferous vegetable. 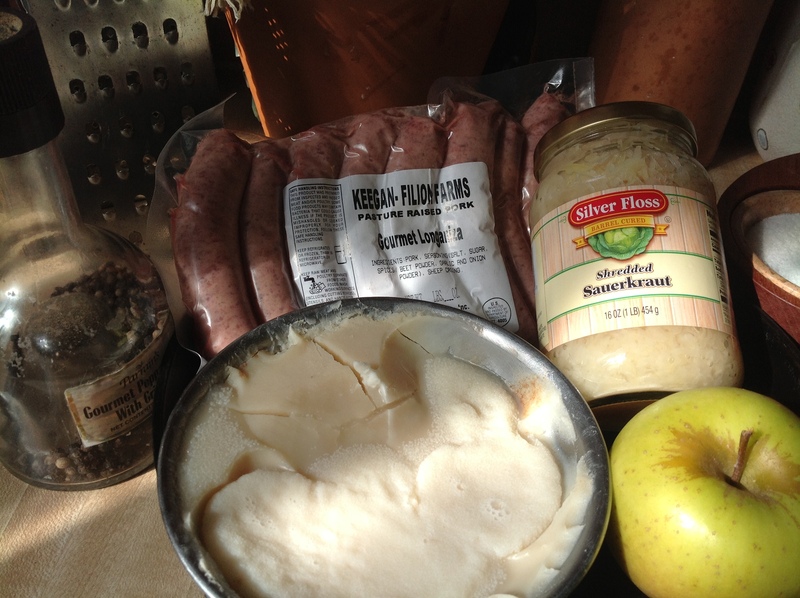 Bavarian Kraut – a milder flavor, sweetened with sugar and caraway seeds. Winekraut – fermented in white wine. Sauerkraut Salad – a mild, slightly sweet salad which includes onion, red peppers, vinegar and other seasonings. Can be used hot or cold. Happy Mothers Day u ready?